A synchronising and load share unit is the ultimate generator controller, they come in many forms including allowing up to 16 generators to be combined together and even providing power to the national grid electricity system. The synchronising and load sharing module can also be used in conjuction with a 'mains controller' to monitork the mains and act as an ATS for all the generator sets. The DSE8680 module is designed to control a bus-tie breaker, manage the synchronising and check-sync across the breaker and automatically control the DSE MSC (multi-set communications) link when opening or closing the bus-tie breaker. The DSE8680 module has been designed to work with DSE8610 and DSE8710 Load Share control modules which support up to 32 generators. The DSE8003 7" Colour Multi-Set Display module is designed for use with the DSE87xx rear mounted load share controllers. One controller can be connected to 32 generators on the same site. 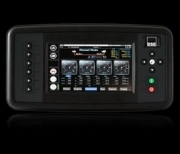 The controller has been designed with a touch screen display, allowing the user to easily navigate between screens.